If you have a worn cast iron or porcelain sink and need to keep within a budget, you could replace it with an inexpensive plastic sink or for about the same amount of money, you could paint it. Painting the sink requires several steps and some elbow grease, but so would plumbing a new sink. Repainting a worn sink is a good alternative to replacing it. The steps for refinishing a sink are the same whether it is a bathroom sink or a kitchen sink. In fact, these directions also work for painting a tub in case you want to do a complete remodel. Cover everything in the room except the sink with drop cloths. Tape of the walls near the sink, as well as countertops and fixtures with painter's tape. Open a window and set a window fan in it, with the air flowing to the outdoors. Wear safety goggles, protective gloves and a respirator or face mask. Clean the sink thoroughly using trisodium phosphate, water and a sponge. Wear gloves and safety goggles. Rinse the sink and wipe it dry with a towel. Rough up the surface using #000 steel wool or 200-grit sandpaper. Repeat steps 2 and 3 three times to make certain the surface is clean and has enough tooth for the paint to stick. Apply a bonding agent to the sink if it is porcelain. Use a spray bottle, clean cotton cloths or paper towels. Allow the bonding agent to dry for about 5 minutes. If the sink is not porcelain, go on to the next step. Put the primer in the paint pot of your spray gun attach the pot to the rest of the spray gun. Apply a coat of primer using a back and forth motion. Apply the primer as evenly as you can. Wait 30 minutes for the primer to dry and apply a second coat. Wait 30 minutes more before putting on the first coat of paint. Clean the spray gun thoroughly and fill it with epoxy-acrylic/acrylic polyurethane enamel, an acrylic polymer coating with a gloss or high-gloss finish. This paint is available in a large range of colors to match your room décor and the finish should last 15 years or more. 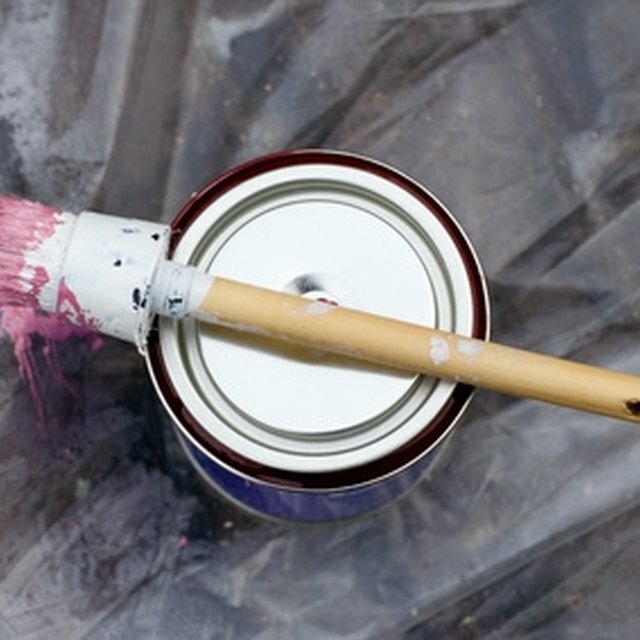 Apply at least three coats of paint, allowing two to four hours' drying time between coats—as you put on more coats, it will take longer to dry. Allow the paint to cure for 48 to72 hours before you use the sink.